More results in more ways than ever before. 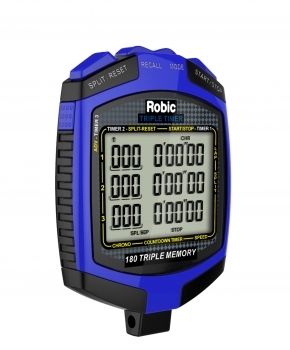 The SC-899 times one, two or three events or participants at once with a single timer and up to 540 memory recall. The SC-899 has three fully loaded time keeping modes. You can choose from 1, 2 or 3 Competitors at once. Start the timers at the same time or separately. EL Backlight illuminates entire display. Start the timers simultaneously or separately; it?s your option?On Demand 180 Memory Recall of up to 3 timers, up to 1000 readings! 1/100 second precision up to 60 minutes. Lap Counter to 999 readings. Use the memory while the timer is running, so you can immediately take another reading without changing modes. Speed timer in mph/kph?can be used at any speedway in the world?input distance to within 1/1000 of a mile or kilometer. Fastest, Average and Slowest Lap speeds and times. Times events up to 24 hours. Program up to three countdown timers to operate independently or simultaneously, they can loop or sequence through each time or stop at the end of the preset time. Time of day, alarm, calendar. Lanyard included.